The walk from the Melrose Caravan Park at the bottom of the hill to the top of the hill takes around 4-5 hours return. The effort is rewarded but this is not an easy walk. More extensive walks through theMount Remarkable National Park usually start from Mambray Creek or Wilmington. The park features the 960m high Mount Remarkable Summit which can be reached along the Mount Remarkable Summit Hike from Melrose, providing impressive views of Willochra Plain and Spencer Gulf. Autumn to spring is the best time to visit the park when the weather is mild and vegetation and wildlife thriving. 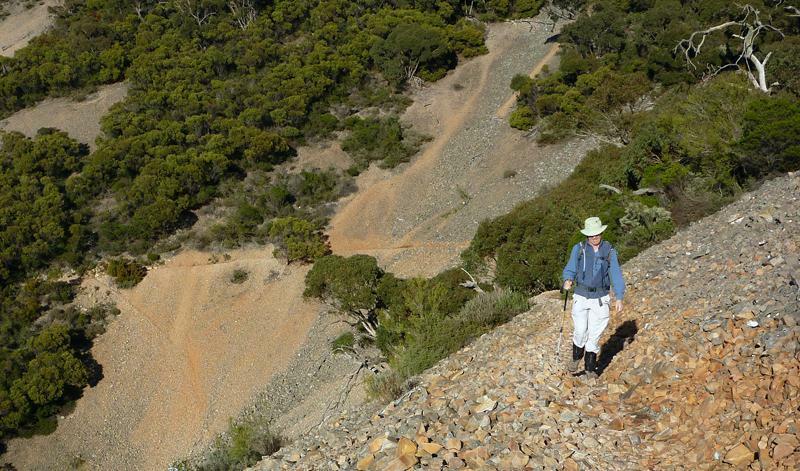 The extensive walking trails provide the perfect opportunity to explore the park’s diverse habitats, from the red quartzite gorges, watercourses lined with river red gums to grassy woodlands and high ridges. Along the walking trails you may see the western gray kangaroos and emus that roaming freely throughout the park. Watch out for the echidnas in spring or the protected yellow-footed rock-wallabies. Visit the National Parks website here.